You hear the rattle of chain and you run for the binoculars – everyone knows that anchoring is a spectator sport. You wonder, “Are they coming our way?” You sneak a quick peek at their anchor. You think, “Oh good, it’s not a CQR.” The guy is at the helm. The tiny woman is at the bow, and they don’t have a windlass. Then you settle down to watch the show just as all hell breaks loose. He starts yelling and she throws everything overboard in a big pile. Oh joy! Have you ever noticed how a normally loving relationship can quickly turn into a battle of the anchorage? When things don’t go as planned, people get excited. Voices are raised, get louder and louder, the words harsher, the emotions higher with every exchange. Well it need not be such a trying ordeal. 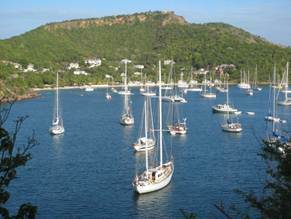 In fact, anchoring should be a lovely dance in the harbour, a celebration of a successful passage. That final step that signifies you’ve made it safely, and now with just a few more simple steps, it will be cocktail time, your favourite time of day. I joined forces with my husband Alex to write a book we called “Happy Hooking – the Art of Anchoring”. (Everyone remembers the title!) It started out that we were known as “the cruisers” in the sailing club. We anchored out a lot. So we were asked to do a lecture about anchoring for all “the racers”. One thing led to another, we crossed oceans, and now our book is in its second expanded edition, we do seminars, we conduct webinars for SSCA’s Seven Seas University, and we have a course online through NauticEd. So, we talk to a lot of people about their favourite anchoring stories (and do we hear some good ones), and we hear a lot about their issues when anchoring. 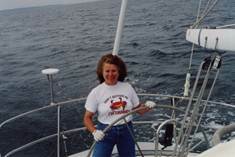 Rather than doing a “how to” here (we have a repository of short excerpts from our book on our website), what I thought might be useful is to share with you the frustrations I’ve heard countless times from the women cruisers and some of the suggestions I’ve shared with them over the years. Then, if you have questions or suggestions, post them here and I’ll do my best to answer them – and of course all the wonderfully experienced women here can jump in to add their expertise! The one thing I’ve learned for certain is that you can never know it all. So here are a few tips on how to keep that anchoring dance a lovely swirl around the harbour rather than a jig on hot coals –just to get us started. Frustration 1: My partner yells instructions at me like I’ve never done this before; it’s so annoying. Tip 1: Take the helm. It’s much easier than dealing with the anchor and rode. All you have to do is drive in a circle, stop the boat, and reverse gently. No heavy lifting. He can’t shout instructions about anchoring if he’s the one doing the lifting. We have a rule on board: NO SHOUTING. Alternatively, take him aside afterwards and calmly explain that you feel humiliated when he treats you like you don’t know what you’re doing, and you don’t appreciate it. Ask him to let you demonstrate your competence next time without step by step instructions. Very often, people don’t even realize that they are doing something that’s not appreciated until they are told outright. By the way, I know it sounds like a gender bias thing here; but honestly I’ve never heard a complaint from a man that his female partner yells at him. Frustration 2: The boat can’t back. It always goes sideways when we anchor and I’m afraid we’re going to drift into boats nearby. Tip 2: Snub along the way. If your boat starts to drift sideways, it’s because you’re going too slow to have steerage and the wind grabs it. To overcome that tendency, snub (temporarily secure) the rode and stop letting out more until the boat straightens out. The anchor, as long as it is already touching the bottom, should catch just enough to set lightly, the breeze will swing you slowly around, straighten out the rode, and your boat will realign itself with the anchor. Once you are aligned again, continue to let our more rode until you have adequate scope. (This actually helps the anchor set as well.) Then you can set the anchor properly. Frustration 3: I can’t hear what he’s saying, especially when the wind is blowing. Right arm out palm forward: "head right"
Left arm out palm forward: "head left"
Arm out to the right palm down moving up and down: "slow down"
Arm circling: "go around again"
One thumb up: "anchor’s off the bottom"
Two thumbs up: "anchor is back on board and secure"
Cut your neck with your hand: "stop yelling"
Fingers in ears: "I'm not listening." 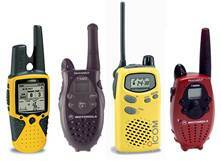 Tip 3a: Get a set of radios. FRS or walkie talkie radios with headsets for hands free operation are great for communication while anchoring, especially for use in the dusk or night time emergency when the wind scatters every word to kingdom come (see also: http://goo.gl/Bnctc). The EU equivalent is the PMR446 Pan European Radio system which uses similar (often the same) models as FRS but chipped for a different frequency. Tip 4: Get yourself an inexpensive rangefinder. You can find them for golfers online for very little money. All you have to do is gauge how high an object is to have it tell you how far away it is. 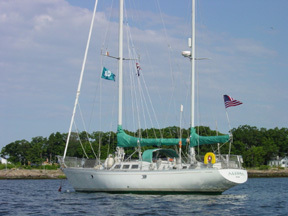 Most masts are about 50 feet tall. So there you go. Frustration 5: Our anchor never holds on the first try when we set it, so we always have to re-anchor multiple times. Tip 5a: More Scope. It could simply be that you didn’t let out enough scope for the anchor to address the bottom at an effective angle. Let out more scope when you set the anchor. You can always shorten the scope after the anchor is set if need be. Tip 5b: Slow down. We often see people rushing. 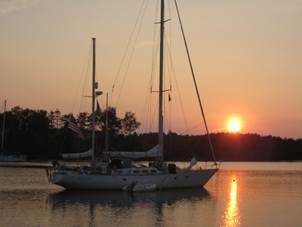 Just slowing down helps – stop the boat, drop the anchor slowly while reversing at idle speed and let out plenty of rode (5:1 minimum), tugging gently on the rode to help it grab. Then give the anchor some time to settle. Finally, set the anchor by putting the engine into reverse gently at idle speed. If you gun it right away, you are likely to yank it out. If you are expecting a blow, gradually increase the engine speed until you feel the anchor bury itself and you can verify by objects ashore that you are not moving (see sidebar). Tip 6: Get a new anchor. There can be multiple reasons why your boat would drag anchor, including using too little scope (less than 5:1) and having too small an anchor for your boat’s displacement. If your anchor is a CQR, then read all the recent independent reports on how poorly a CQR performs relative to the newer anchor designs. Plows are meant to plow, and a CQR does just that. It was a great design in the 1930s when it was introduced, but it is truly outdated. Your boat is a huge investment. Protect it with good safety gear – i.e., anchor. If you think you are doing things right and you still keep dragging, it may also be that your anchor is worn or damaged. An anchor that is damaged will not perform as intended ever again. 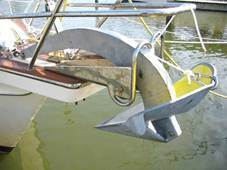 A bent fluke or shaft or a worn hinge is all it takes to cause an anchor to roll out to its weak side. The same goes with cheap knockoffs. They are not built to exacting specifications. So if the anchor doesn’t hold every time, get a new anchor. And you can’t go wrong if you oversize it. Frustration 7: I can never seem to tell if the anchor is set. Tip 7: Feel the rode. That’s an easy one. First off, many of the new anchors bite the bottom so hard that you can see the rode get bar taught and feel the boat shudder when it comes to a grinding halt. But there is another way, put your foot or hand carefully on the rode where it leaves the boat while the engine is in reverse. If the anchor has not set, you’ll feel it jiggling as the anchor bounces along the bottom. If the anchor is set, you won’t feel a thing. Tip 7a: Take bearings. Pick out two stationary objects – one nearer and one farther away. If they move in relation to each other, you are moving. If not, then you are stationary. You can also set a GPS alarm. There are loads of apps that serve that purpose these days. Frustration 8. I have no idea how much rode we have out. All our markers have worn off. Tip 8: Refresh your geometry. The proportions of a triangle always remain the same no matter how big the triangle gets as long as the angles of the triangle remain the same. The triangle made by the surface of the water, the height from the surface to the deck, and the length of the rode above the surface are proportional to the same distances measured at the bottom. 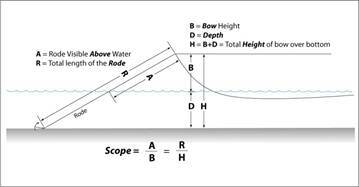 So if you see 25 feet of rode above the surface and your bow is 5 feet above the water, you have 5:1 scope all the way down. The rode has to be completely stretched out so it works best with rope rode, but it is pretty close for guess work. Pretty cool, eh? If you have any pet frustrations, please either add them below and we will respond, or shoot us an email! Basic anchoring technique for “Hooking Happily”! Review the charts and wind conditions before entering the anchorage. Pick your spot based on the expected conditions. Match up what you saw on the charts with what’s inside the anchorage. Identify shallows, cable crossings, moorings, channels and other elements to avoid. Note the position of boats, how they are swinging, and how much scope they have out. Try to pick a spot near boats that are similar to yours as you are more likely to swing similarly. To help you judge distances from boats and other objects, use a golf range finder scope. Drive around the circumference of the circle you expect to swing around when you set anchor. Make sure there are no obstructions. Check the depths. Drive to the center of the circle. Stop the boat. Reverse gently while you let out the rode slowly. Do not drop all the rode in a pile all at once. It will tangle up. Let the wind push you back as you let out more rode. When the anchor hits the bottom, tug gently on the rode to help it begin to set. Continue to let out more rode until you have enough scope – 5:1 is optimal. More for a blow. If your boat starts to drift sideways, snub the rode and stop letting out more until the boat straightens out. Because the anchor is somewhat set, the breeze will swing you around, straighten out the rode, and your boat will realign itself with the anchor. Once you are aligned again, continue to let our more rode until you have adequate scope. Set the anchor by backing down GENTLY in reverse. If you back down hard, you may simply yank the anchor right out before it has a chance to set properly. Put a hand or a foot carefully on the rode with the engine gently in reverse to feel if the anchor is set. If it is not set, you will feel the vibration on the rode as the anchor skips over the surface. Keep an eye on stationary objects ONSHORE to see if you are moving or stationary. If you are not moving, then your anchor is set. Now, if necessary you can either shorten the scope to 3:1 minimum in a tight anchorage or lengthen it to 7:1 or more if you expect a blow. See. Simple. Prepare for cocktail time.